Everyone's favorite marsupial returns, and he is enhanced, entranced, and ready to dance! Experience Crash Bandicoot like never before in this fully-remastered HD remake! Take on the classic epic challenges and adventures of the three games that started it all! Featuring Crash Bandicoot, Crash Bandicoot 2, and Crash Bandicoot: Warped! Looking for a game your kid or a child you know can enjoy on the family Xbox One? We've rounded up the top 10 best Xbox One games for kids ages 7-12. Looking for the elusive Trash Bandicoot? Here's how to unlock this funky easter egg. Crash Bandicoot N. Sane Trilogy isn't 100% the Crash you remember. Learn about what's changed here! 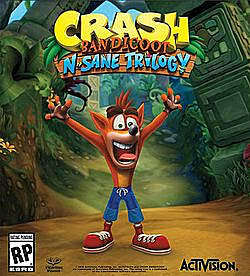 The Lost City is one of the first levels where Crash Bandicoot starts to get tricky. Luckily, you've got Gameskinny here to back you up. Those pesky pass-through platforms sure look enticing. Here's how to make em solid. Refresh yourself on all the different types of crates there are in the Crash games to make the most out of your platforming adventure. Here's how to do the slide attack in Crash N. Sane Trilogy! We'll show you how to figure out what times you need to beat to get Relics -- and a few tips for beating those times. How to find and collect all of the Colored Gems in Crash 3 Warped from the Crash Bandicoot N. Sane Trilogy (with screenshots). How to find all Colored Gems in Crash 2 from the Crash Bandicoot N. Sane Trilogy (with screenshots). With games like Yooka-Laylee, Crash Bandicoot N-Sane Trilogy, and Super Mario Odyssey all coming this year, here are six platformers from the 90's we'd love to see return!